Many organisations today find themselves stagnating, struggling just to keep up in today’s rapidly changing environment. Companies and charities alike rise and fall with alarming rapidity. Employees and managers have little or no loyalty to their organisations and are always on the lookout for a bigger pay check or the next step in their own careers. All of this presents major problems for any group, whether a gas station, church, or international corporate powerhouse. And they can all be traced back to one thing – culture. Culture is the soul of any organisation. A strong culture breeds loyalty, innovation, and success. A weak culture will breed cynicism, apathy, instability, and the eventual demise of the organisation. Yet, culture is an often overlooked aspect of business thinking and strategy. In this work, a reader will learn what culture is, why it is important and how to fix it when it goes wrong. Leaders, management, even employees on the front lines will benefit from the discussion. From the importance of a clear organisational vision and the symbols that reflect and promote it to the way employee attitudes affect the bottom line and how to harness them, Corporate Superpower will help you to identify and correct problems in your organisation and turn a renewed culture into long-lasting success. This book is for anyone in business wishing to rise above the ordinary every day. “Today many large and mega corporations spend a great deal of money and time trying to increase the originality of their employees, hoping thereby to get a competitive edge in the marketplace. The Book “Corporate Superpower” by Oleg Konovalov is a powerful tool and a critical ingredient to rethink modern corporate culture. No matter the industry or expertise, the visionary nature of “Corporate Superpower” will engage your team and strengthen your corporate environment. 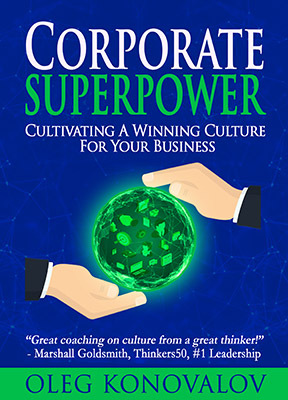 “Corporate Superpower” exhibits an extraordinary transformative leadership model that empowers CEO, managers, and employees, and helps understand the full spectrum of prioritizing the mental and emotional well-being of employees to increase profit, improve lives, transform culture, and sustain corporate growth. A modern business and society need such creative thinking and extraordinary approaches that allow making a leap forward and reaching new heights in development. H.E. Ms. Sania A. Ansari, Chair Person, Ansari Group Ltd. 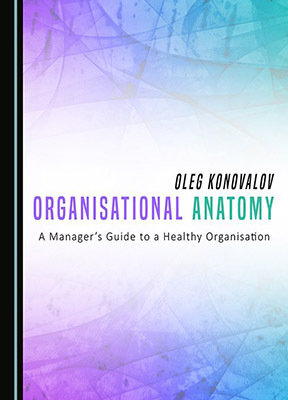 This book offers a discussion of a new management concept, “Organisational Anatomy”, which views organisational processes and functions from a biological perspective. This approach naturally explains the ongoing internal and external organisational processes and optimum configuration of different organisations. Organisations are living creatures which breathe, move, and develop inside their specific environments. Biological examples offer a useful way of making sense of complex ideas, because they can be related to everyday existence. As such, this allows the reader to intuitively understand the organisations they work at and interact with on a daily basis. By classifying different types of organisations and looking at their biological functions, Organisational Anatomy links existing theories and discusses five archetypes of organisations – producers, knowledge-dependent, location-dependent, donor-dependent and state-affiliated organisations. By looking into their specific features, the characteristics of organisations of different ages and levels of maturity, the access and utilisation of resources, and the development of productive external relations, this book gives insight into the role of each function in achieving superior business performance. The Organisational Anatomy approach allows the development of a holistic picture that will allow businesses to achieve higher performance and recognise problems and difficulties by considering organisational pathologies and diseases. Organisational Anatomy gained excellent endorsements from fDi Magazine (Financial Times), UK Trade & Investment, Small Business Trends, and other top experts. Thanks to the encouraging readers’ reviews Organisational Anatomy earned a place in the Hot 100 Best Business Books (2016). Breaking into the Russian market has always been a challenging task, particularly for Western organisations, and personal networks play a crucial role in achieving this. However, personal networks that exist in Russian business remain a mystery to Westerners. This has not received adequate attention from academics to-date, even though success depends upon adapting to the Russian culture and business life. The aim of this book is to address the role of informal relations and trust in Russian society and business. Our findings provide a deeper understanding of the relationship between Russian business and personal relations, thus helping Western practitioners and investors to enter the Russian market and develop strong business-stakeholder relationships. Our intention is not to criticise or dress up the image of Russia but to provide coherent analysis and discussion on how things work there. 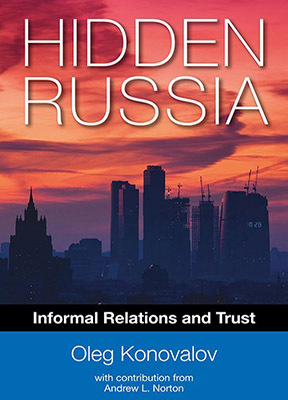 Hidden Russia explores the phenomenon of Russian personal networks from inside the mind of Russian business people, revealing peculiarities of the inner life, norms, trust, knowledge transfer, and entry and exit rules Russian business people regularly experience.